sound/map is an ongoing series of performances that focuses on listening and mapping of sounds in a space. 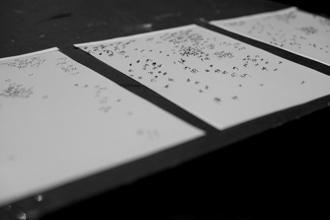 For sound/map 5.0, Bilwa and Jasmin will perform a sound improvisation concert while Aya maps the qualities, regularity, and coordinates of these sounds; using her system of numbers. The accumulating pages from this series will culminate in the form of a book.